Purchase Opportunity The complete property is for sale, church building, fellowship hall building and annex. The campus totals approx. 31,000 square feet. 925 persons (pews and choir stand). The sanctuary is approx. 130 ft by 72 ft. The balcony was renovated to include 9 classrooms and the nursery. The nursery has a window onto the sanctuary and half bath. Located directly adjacent to the main entrance. Entrance to the sanctuary contains no steps. Four offices are located throughout the building. The pastor’s office is on the main floor (20 ft by 24 ft). It has a fireplace and half bath. A complete sound room is adjacent to the altar. The sanctuary has the lighting in place for a television broadcast. Duplicating facilities are present in the balcony. Four apartments are located on the second floor facing onto Seven Mile (2, 2 bedroom units and 2, 1 bedroom units) with great interior finishes, corian countertops and modern appliances. The sanctuary is heated by a boiler (steam heat and is currently broke and needs to be replaced) with supplemental air conditioning (air conditioning units have been vandalized). The rest of the building has forced air heat and air conditioning. 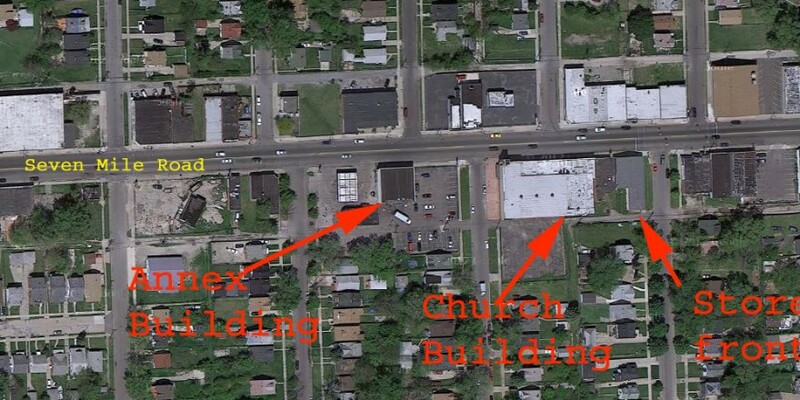 The annex building (1228 East Seven Mile) is located directly across the street from the church building (1300 East Seven Mile). The building is 58 ft by 50 ft. The fellowship hall first floor is 38 ft by 38 ft. The kitchen has 2 sinks, a freezer and refrigerator, dishwasher, stove and 2 ovens. The overall size is 9 ft by 17 ft. The second floor is wide open and 58 ft by 50 ft. Currently, it is configured as a children’s church. A one car garage with a roll-up door is part of this building. This is a great amenity for the pastor. Both buildings have attached fenced parking lots. Together they hold approx. 120 cars. Small sheds are present for security personnel. The building has forced air furnaces that provide heat and air conditioning. Actual Expenses will be determined by the actual use of any given church. The above represents the use by Liberty Temple Worship Center and the expenses incurred by the buyer will be unique to that buyer. The above expenses also include the utilities for 1346 E. Seven Mile (which is no longer part of the sales package). Pastor Hart came to Detroit in 1954 for a tent revival but stayed to found the Liberty Temple Worship Center. This humble beginning was the foundation for building the ministry. The church building is a former theater and was purchased in 1956. 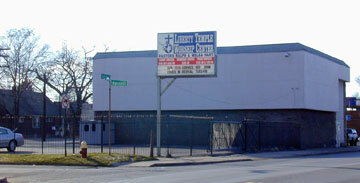 The fellowship hall building was built by Liberty Temple Worship Center in 1972. The annex building was added in 1984. The current church campus includes three buildings totally up to 36,400 square feet in three buildings. The Liberty Temple Worship Center has a sanctuary that seats over 900. The television ministry allowed the church to reach additional thousands. It is Liberty’s hope that a new congregation will be able to build upon this foundation and continue god’s work in the neighborhood.